FIFA 14 demo is available for download! 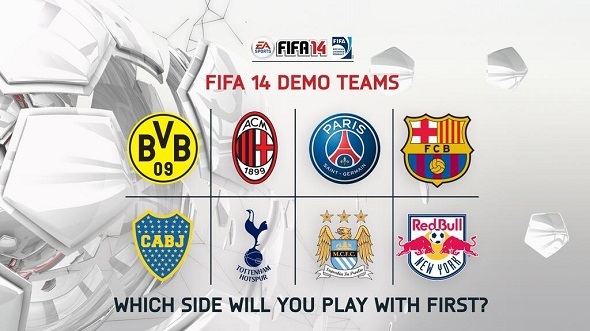 As we promised you yesterday, today we are going to tell the latest news about FIFA 14 demo. Thus, today all fans of this stunning football simulator will be able to play on the world-famous Camp Nou stadium, choosing as your team one of the following clubs: AC Milan, Borussia Dortmund, Boca Juniors, Manchester City, New York Red Bulls, Paris Saint-Germain, Tottenham Hotspur, FC Barcelona or one unique club of FIFA Ultimate Teams. PC version of FIFA 14 demo is already available for download on Origin. Xbox 360 and PS3 versions of the demo will appear today in the evening. So, dear friends, download the FIFA 14 demo, play, enjoy and do not forget to leave your opinions about the game and its demo in the comments below. FIFA 14 game will be released on September 27 for the current generation of consoles and PC, and in late November for PS4 and Xbox One.